Light is something we all take for granted unless you live in the arctic circle or something! But if you get into gardening, or more specifically, indoor hydroponics, you start to appreciate how valuable sunlight truly is. You cannot grow anything in the darkness. Mushrooms and fungi are an exception of course, but for any plants with green chlorophyll coursing through their leaves, light is mandatory. Understanding light requirements are important for your plants as well as for your pocket/bank balance! Electricity does not come cheap, and your energy bills will shoot up if you don't plan your hydroponics system properly. So if you want to be a successful farmer, you need to know your photosynthesis and plant light requirements basics. Let's get started then. Photosynthesis is a topic that is done to death in our science classrooms. But unless you are a keen botany enthusiast or someone who pursued higher studies in the field, you probably don't remember a whole lot about the process. Let's refresh that memory with a few basic concepts. Asking why plants need light is like asking why we need fire or heat to cook our food. Carbon Dioxide, through the pores in the leaf. To combine these ingredients and cook up some food, plants need energy. This they derive from the sunlight, using the green chemical called chlorophyll in their leaves. 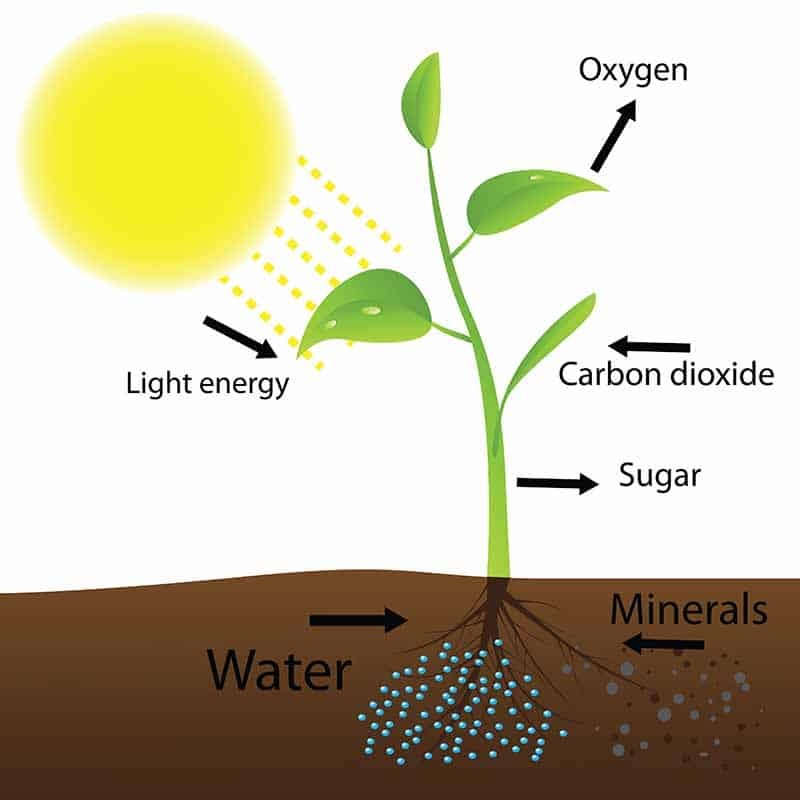 Carbon Dioxide and water, in the presence of Chlorophyll & Sunlight, combine to produce Glucose and Oxygen molecules. The glucose is used by the plants for growth and bearing fruit, while the oxygen is released into the atmosphere as a by-product. This is a simple definition of the process of photosynthesis that happens in a plant leaf in the presence of chlorophyll and sunlight. You may have noted the absence of any minerals in the equation. But minerals like magnesium and phosphorus are essential for photosynthesis. Without magnesium, plants cannot create chlorophyll in the leaves. And phosphorus is essential for creating proteins. The survival of a plant is entirely dependant on the source of light. In the case of all outdoor plants, the sun is the only source of light. When the first leaves appear on the plant, it will try to grow towards the light source, to ensure that maximum light is received by the leaves for photosynthesis. Some plants take this to its extreme and follow the sun as it traverses the sky in the day. The sunflower is the most famous example of these plants, called heliotropic by botanists. The rest of the plants are called phototropic, which means that they respond to light. The stems of these plants try to grow towards the direction of the source of the light. Consider a garden plant which is partially in the shade. When light shines on a part, it stimulates the secretion of growth hormones called auxins in that area of the stem. These auxins cause that part of the stem cells to elongate, forcing the stem to grow towards the sunlight. These are changes that occur continuously through the life cycle of a plant. If there is one disadvantage to sunlight, it is the fact that it is not constant all through the year. The duration and intensity of sunlight received fluctuate with the changing seasons. So plants have adapted to these changing seasons as well. In the summer and spring, with light being plentiful, most plants focus on growth, blooming of flowers, and bearing of fruit. When the light intensity and duration reduces as winters approach, the plants put more emphasis on conserving energy and reducing growth. Photosynthesis is reduced in the fall, and leaves start losing chlorophyll. This is why leaves tend to turn brown, yellow, or red in autumn. Light is a form of energy that moves as an electromagnetic wave. 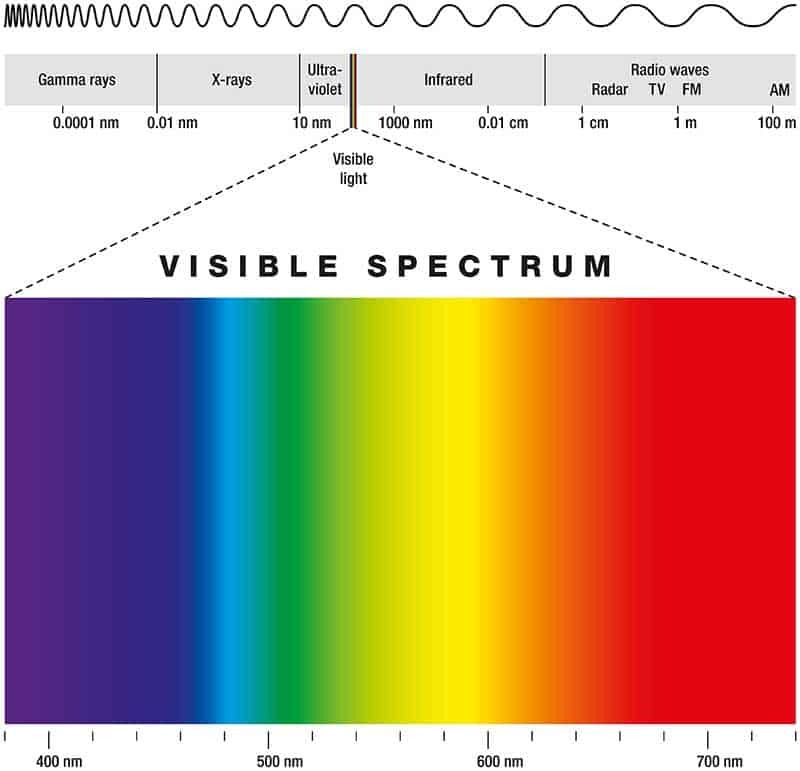 What we see as visible light is made up of electromagnetic radiation in a specific range of wavelengths. Visible light falls between the wavelengths of 390-700 nanometers. Light in different wavelengths appears as a particular color to the human eye. When you use a prism to scatter the light, you can see these individual colors, as VIBGYOR or ROYGBIV. Like the cells in the human eye, the leaves in a plant also respond to the light energy falling on it within these 390-700nm wavelengths. To be more precise, the chlorophyll in the leaves absorb most of this light to create food. We said "most of the light," not all of it. Ever wonder why plants appear green? It is because chlorophyll reflects the green part of the spectrum (495-570nm). - Introduction - What is light? 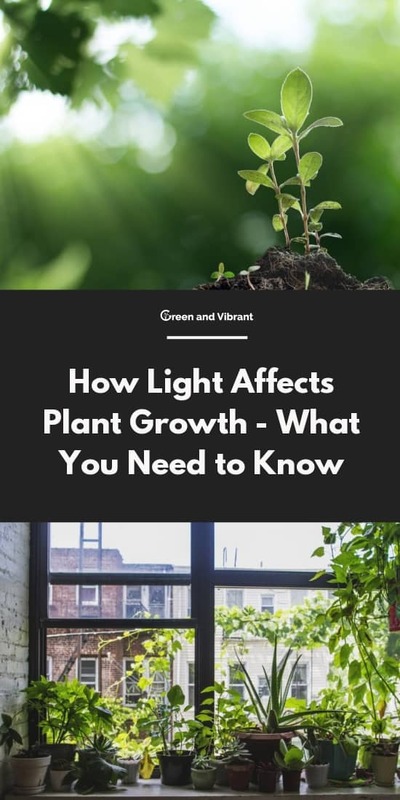 With a wavelength between 400-500nm, this light has high energy and affects the leaf growth (also called vegetative or "veg" growth) of plants. Blue light has an impact on chlorophyll production, but you only need it very small quantities when compared to red light. If a plant does not get enough blue light, it will start getting weaker, with yellow streaks in the leaves instead of green. This low-energy light has a wavelength of 600-700nm. It is essential for flowering and blooming of the plants. Deficiency in this light wavelength will invariably result in delayed flowering or very weak blooming stage in plants. Understanding the spectrum is vital for hydroponics. Out in the sun, plants get all the light energy they need in all the important wavelengths. But as we will see in the next section, replicating the effect of sunlight using grow lights is not a very simple task. Intensity: How bright the light is, or how much energy in the form of photons is falling on the leaf. This determines the rate of photosynthesis. The higher the intensity, more photosynthesis occurs in the plant. Duration: How long the plant receives the light. Outdoors, this is regulated by the seasons, and plants have evolved their life stages around it. Arbitrary changes in light duration will affect the growth of the plant. Spectrum: Plants need both red and blue spectrum light to flourish at different stages of growth and to bloom. In an indoor grow system, you will have to pick artificial grow lights capable of fulfilling all three factors. Of these, the duration is the easiest to replicate, as you just have kept the lights on for a set period. Intensity can be a challenge with some grow lights. Growers change light intensity by changing the distance between the plant and the light bulb. The closer the light source, the more intense the light. The problem here is that many grow lights also emit a lot of heat. So if you place the blubs too close to the plants, they may wilt or die. So a careful balance has to be maintained. Wavelength is another challenging aspect. The sun is a perfect single source that radiates enough energy for the plants in all the wavelengths, blue and red. We do not yet have a single light source capable of emitting both red and blue spectrum light in adequate quantities. Indoor growers get around this limitation by using a mix of warmer and colder lights. Perfectly replicating sunlight indoors is not easy. But by using multiple light sources and constant tinkering, you can achieve phenomenal results with indoor grow lights. Now to complete this article, we will take a quick look at some of the popular grow light options for indoor hydroponics. These are special incandescent lights used widely in indoor horticulture. They are power hungry and emit a lot of heat. So you have to be careful when placing them close to the plants. HID lights include High-Pressure Sodium (more red light) & Metal Halide (more blue light) options. Large-scale growing operations use these lights more than small-time hobbyists. These are less energy intensive and do not emit a lot of heat. They are long-lasting and easier to manage than HID lights as well. But Fluorescent lights are known to emit cooler light at the blue end of the spectrum. So they may not be able to provide complete light that your plants need. If you are growing herbs, these are quite effective. You will find fluorescent lights more often in small home-based grow systems. Many growers tend to mix them with other red-spectrum lights when growing fruit or flowering plants. The most common Fluorescent Lights used for growing are CFL grow lights and T5 grow lights. These are gaining popularity these days, especially among hobbyists. Small, compact, and very energy efficient, they can be set up very close to the plants. But they may not be suitable for large-scale grow operations, as they cannot spread intense light across large areas. But LEDs can be designed to emit either red or blue spectrum wavelengths. And you can put a lot of these small LEDs in a light panel. So you don't need to mix and match different types of lights when using LEDs. LED grow lights tend to be the most effective when it comes to growing indoors. Light (and its energy implications) is one of the main limiting factors in hydroponics. The sun is a near limitless source of energy. Replicating it indoors is not easy. But the technology is evolving at a fast pace. We have grow lights that are more energy efficient than ever before. There is no reason not to expect a brighter future for indoor hydroponics. Hope you were "enlightened" by the contents of this post!